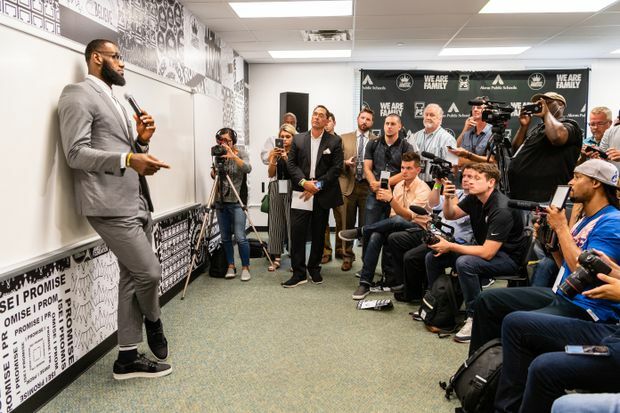 LeBron James addresses the media after the opening ceremonies of the I Promise School on July 30, 2018 in Akron, Ohio. LeBron James wore a tailored, slim-fitting, grey designer suit and black-rimmed glasses. He wanted to make a strong impression on the first day of school. After all, it’s his school. Hoping to inspire and provide support to kids facing the same problems he experienced during a rough childhood, James officially opened the I Promise School, a cutting-edge centre built in a partnership with the NBA star’s family foundation and Akron City Schools. As the Goodyear blimp soared over him, James reminded a crowd that included family, friends and fans who will now watch him play for the Los Angeles Lakers after four more mesmerizing seasons with the Cleveland Cavaliers, that he’s one of them. Just a kid from Akron. Long before he became a globally celebrated sports celebrity and three-time champion, James was a lost little boy growing up without a father and wondering where his life was headed. He and his mom, Gloria, struggled for years. There was little money and less structure. They moved constantly, and there were long periods when James didn’t attend school — he missed 82 days in fourth grade — because Gloria didn’t have a car and there was no other way of transportation. “We didn’t have stability day to day where I didn’t know where I was going to be living, so it was no way that I could even get there,” he said. “So, it was a surprise to me when I woke up and I was actually going to school. So, I just felt like every day I was just waking up and I had just a bunch of time of nothing. There were just a lot of empty days, empty nights and just kind of a no future thought process. The entrance to the I Promise School. His past is shaping the future for others. 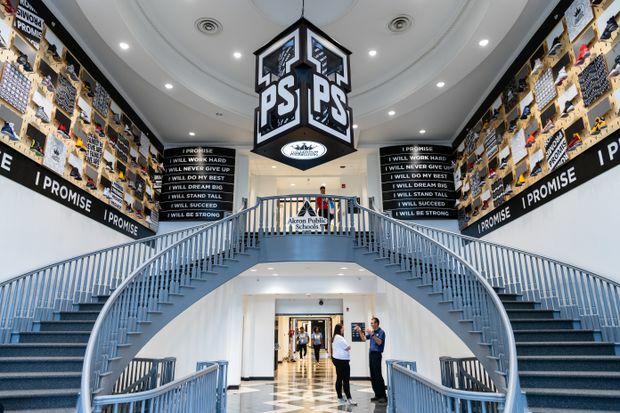 James has modeled the school, and so many other education initiatives started by Michele Campbell, executive director of The LeBron James Family Foundation, to combat the obstacles he faced. He’s giving at-risk children, some with learning disabilities and others from broken homes, opportunities they couldn’t have imagined, including food and other amenities. The I Promise School’s curriculum is centred around the foundation’s “We Are Family” philosophy, an encompassing approach that allows for student growth and family development. The school follows a non-traditional schedule with year-round programming and days that began at 9 a.m. and end at 5 p.m. The school, which will expand to include grades 1-8 by 2020, also has a resource centre that helps families “navigate daily challenges and facilitate long-term planning,” and parents of I Promise students can earn their GEDs or high school diplomas. 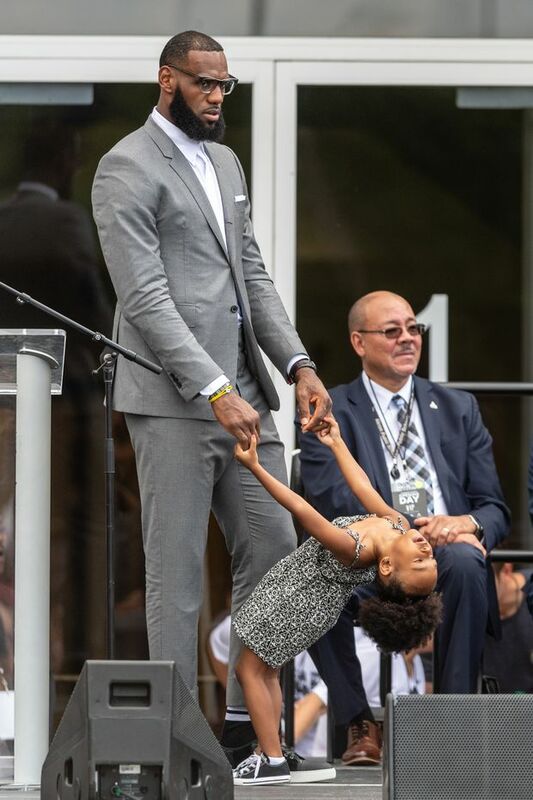 LeBron James plays with his daughter Zhuri during the opening ceremonies. It’s cutting-edge, daring and potentially a template for inner-city schools around the country. James has already seen success stories with kids who began in his I Promise program in 2011. Moments later, James stood before people he has known all his life and asked for help.